This savory tart is simplicity itself thanks to packaged pizza dough. Choose the best quality you can find in your supermarket’s refrigerator section. Alternatively, you can make your own pizza dough. A good recipe may be found here. You will need a sheet of parchment paper unless one comes with the pizza dough, as it does in France. I generally bake the pizza in a tart pan with a removable bottom — easy to manipulate in the oven. But any baking sheet or oven pan will work fine. Be sure to turn the oven temperature down a notch before placing the pizza in to bake to ensure that it doesn’t cook too quickly. Each oven has its own personality. I would suggest opening the oven door to check on the tart from time to time while it is baking. 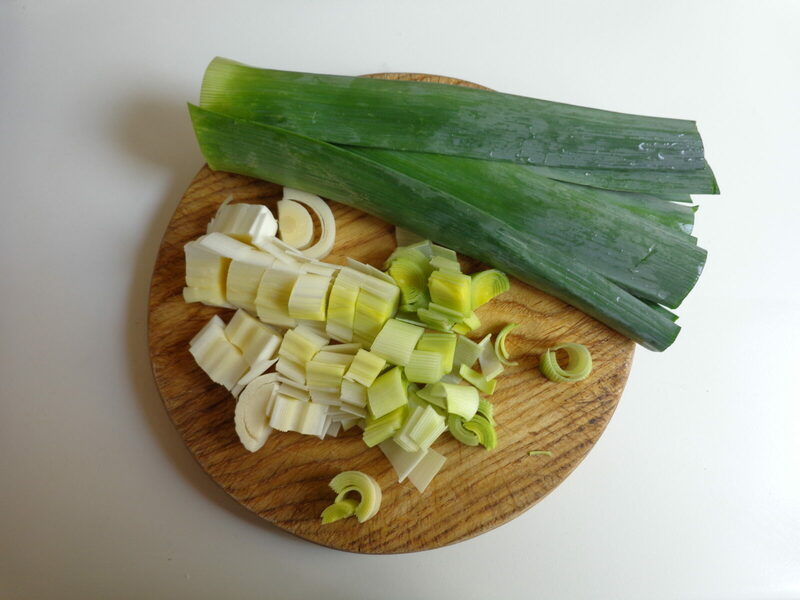 Wash the leek carefully and trim off about half of the dark green leaves at the top. Cut the remainder in half. Trim off the bottom. 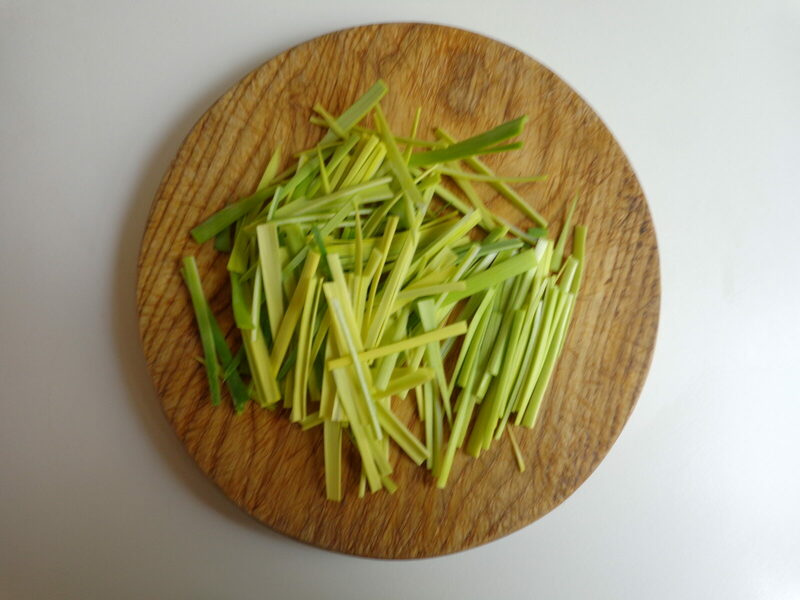 Slice the bottom half of the leek — the white part — in two lengthwise, then cut crosswise into pieces about 1/3 inch (1 cm) wide. 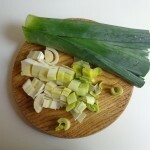 Set aside the top part of the leek. Remove any rind from the bacon and chop into lardons — crosswise strips about 1/4 inch (2/3 cm) wide. Preheat the oven to gasmark 8 (450 F, 230 C). In a heavy-bottomed pot, heat the olive oil to sizzling. Add the chopped leek pieces, turn down the heat to medium-low, and sauté gently, stirring occasionally. You want the leek bits to be wilted but not brown. After about 5 minutes, reduce heat to very low and cover the pot. Cook 5 minutes more. Turn off heat and remove cover. Roll out the pizza dough and place on a sheet of parchment paper. Make a rim by fluting the edge of the dough — roll the edge up and over itself, using your thumb. Transfer to a baking sheet. 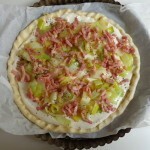 Spread the cream over the pizza dough. Strew the leeks evenly over the surface. Sprinkle on the bacon bits. Grind some black pepper on top. Place in the oven, turn the heat down a little — to gasmark 7 (425 F, 220 C) — and bake about 20 minutes, until the crust is golden brown and the cream has set. 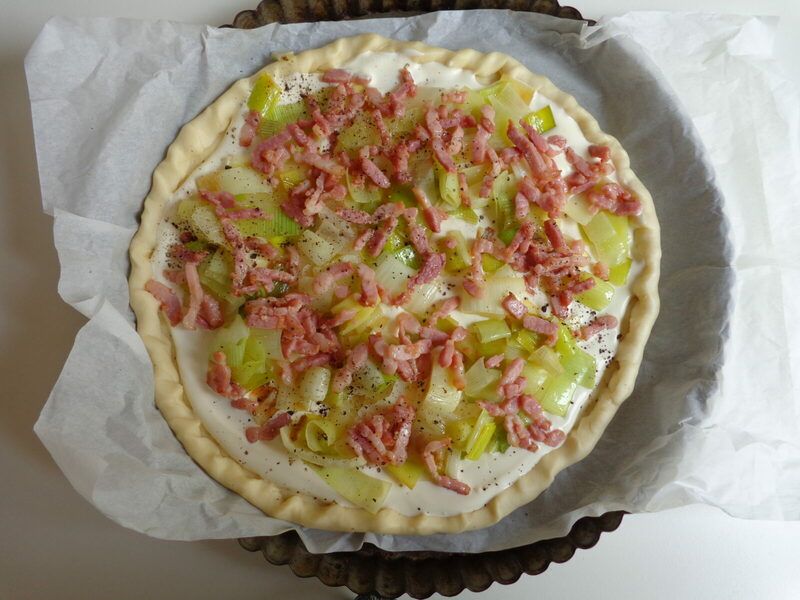 While the tart is baking, prepare the green part of the leek. 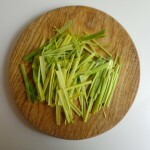 Remove the thick outer leaves and discard. Separate the inner leaves and wash very carefully, as they can be full of sand. Slice crosswise into sections about 2 inches (5 cm) long. Now slice lengthwise into thin strips. In a frying pan, heat 1 tbsp. (or more) sunflower oil to sizzling. Add the leek strips and fry over high heat, stirring, until crispy, about 5 minutes. Drain on paper towels. When the pizza is ready, remove from oven. Top with the fried leek strips. Serve at once, on its own or accompanied by fresh greens. Serves 4 as a starter, 2 as a lunch course. 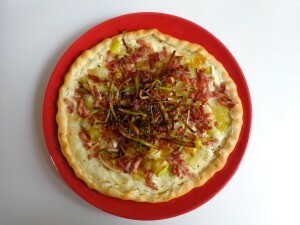 This recipe is adapted from a French cookbook called ‘Petit Larousse des recettes du potager’.